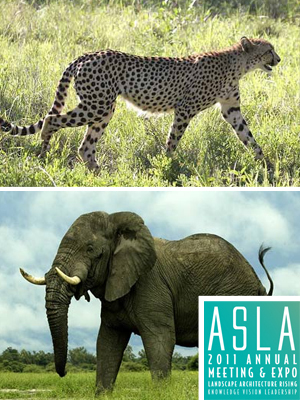 Is Your Firm an Elephant or a Cheetah? The marketplace is changing. Big firms like AECOM are getting bigger and becoming “one-stop shops” so how can small landscape architecture firms of around 30-40 people compete? How can these small firms accept the “risks and liabilities” associated with increasingly complex projects? Each firm described their own current predicament: OLIN has grown through the recession and is 35 years old. There are now 11 partners but the main question is one of succession with the expected retirement of Laurie Olin, FASLA, one of the world’s leading landscape architects. Martha Schwartz, whose firm yo-yos between 30 and 70 people, said she has worked her way out of the U.S. and now does most of her work in Europe and the Middle East. In contrast to her earlier work, she now focuses on “sustainable strategies bigger than the site scale.” James Corner’s office has about 35-45 people. From 1998 to 2011, he grew very quickly, adding about 25 people. The lead designer of the High Line park, Corner focuses on “complex projects in the public realm.” Peter Walker, landscape architect behind the new 9/11 memorial in New York City, has around 35 people, “goes where the projects are,” but usually focuses on “slow, big, public” projects. West 8 has around ten staff in New York and another 50 in the Netherlands. When Corner was starting out as an intern, he worked on the Royal Dock Works project in London. In one of the early examples of a multidisciplinary project, there were architects, landscape architects, ecologists, transportation engineers. However, “nobody could speak outside their disciplines. No one was listening to anyone else. There was lots of scoffing.” This was because “no one had been trained to deal with these projects. Nobody could orchestrate a bigger synthesis.” Corner said this is where “we need to target the entire field” because there’s “something about our creativity. We are good listeners, work well with systems, and are not control freaks.” Furthermore, a “smart landscape architect can offer more direction and orchestration,” and not just add in the trees at the end of the project. Schwartz agreed, adding that “big firms can’t go where we go” providing “strategic conceptual approaches.” Landscape architects are focused on “systems but also materials, the texture of projects.” However, she also said big firms, unlike smaller ones, can get “infrastructure going, they can get a beachhead into places like China.” Then, once they create the ecosystem, the “little animals” (i.e. smaller firms like hers) can benefit and come in. She added that mass-produced landscapes aren’t possible – the conditions are “so different, variable” so in that sense, there would always be work for firms that do quality work. How Can Small Firms Get the Edge? Schwartz thinks that “design has to be exemplary to beat AECOM.” Gueze at West 8 said that a design “needs to be outstanding. It can’t be mediocre. To get a job, you have to deliver.” It also pays to have a network. “You have to know people. There’s not just one client. They have issues, communities, problems they are dealing with.” Furthermore, “you need to have outstanding rhetorical quality. You need words, metaphors because your ideas will be constantly undermined.” He believes that this is not related to firm size. Corner thinks that’s of course true but wanted to focus on “management structures,” arguing that “structures can give us a shot” at the big projects. Walker seemed to disagree, arguing that he’s “resentful of people who say the profession should do this or that,” adding that Corner can “go big if he wants” and scale up his practice to take on the big firms. “There are lots of assumptions about the motivation of our office,” Sanders said, if the firm grows larger. “We understand people’s profit agendas but it’s a personal decision to decide to go big or small.” She thinks there are also other agendas: “It’s not always about making money.” Large firms don’t make more profit than smaller firms as a percentage of revenue. Where do your firms need to go? “Everyone is up here because we invented something. We create value, edge, and that moves the culture forward,” said Schwartz, and this is increasingly something that clients want. As a whole, she said landscape architects are far better now than 30 years ago in meeting the needs of clients. OLIN is more focused on growing its own people. “To do this creatively, effectively, it takes concerted effort.” Sanders’ firm is focused on “creating places for people,” and will always value quality. To ensure this, the firm has started a research department to “compliment, bolster our efforts, enriching our conversations with clients.” OLIN wants to make sure their senior people are credible. Where does landscape architecture need to go?